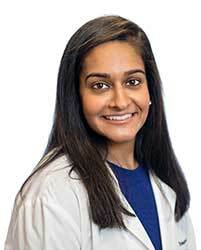 Home » Our Doctors » Trishna K. Masters, O.D. Born and raised in Arlington, TX, Dr. Masters has always dreamt of becoming an optometrist. Wearing glasses at an early age drew her to the optometrist office yearly. After high school, she was selected to be part of a seven year BS/OD program in Boston, MA. During her undergraduate studies, she was involved in the pre-optometry association. She received her Bachelor of Science degree in 2013 from the Massachusetts College of Pharmacy and Health Science University (MCPHSU). While at optometry school, Dr. Masters was a student liaison in class council and was involved in the National Optometric Student Association (NOSA), and Student Volunteer Optometric Services to Humanity (SVOSH). As a student, she traveled to the Dominican Republic to provide free eye care and spectacles to hundreds of patients with the SVOSH program. Here, she genuinely learned to appreciate giving back to the community and understood the value of a pair of glasses to a person in need. During her clinical year of optometric training, she had the opportunity to diagnose, co-manage, and treat ocular diseases, trauma, and systemic related ocular conditions, such as diabetes. She also provided pediatric and geriatric comprehensive eye exams at the VA hospital, community health centers, and private practices throughout Boston, MA and Santa Fe, NM. In 2016, Dr. Masters received a Doctor of Optometry Degree at the New England College of Optometry in Boston, MA. She completed a post-doctorate clinical residency at the SUNY State College of Optometry with an emphasis in Primary Eye Care. Throughout her residency, she trained with glaucoma specialists, retinal specialists, cataract and laser vision correction surgeons. Upon residency graduation in 2017, she worked at a private practice in Arlington, TX. Two years later in 2019, she has now joined Texas State Optical Mansfield as a full time optometrist. She is very excited for this opportunity and shares a passion, along with the other doctors, in providing excellent thorough eye care. Dr. Masters is a licensed Therapeutic Optometrist and Optometric Glaucoma Specialist. She is an active member of the American Optometric Association, Texas Optometric Association, and the Tarrant County Optometric Society. Outside the office, she enjoys spending time with family, traveling the world, working out, trying out new foods, and rooting for all her Dallas teams, especially the Dallas Cowboys.